Casa Milan is a modern interactive area that hosts the “Mondo Milan” museum that hosts AC Milan trophies in a unique way and narrates the Club's history through the innovative matching of rare historic memorabilia with the most advanced interactive technologies. Discover a collection of unique items narrating the most significant moments and important persons in the Club's history. 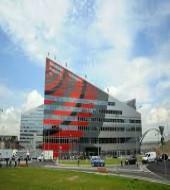 Casa Milan hosts the “Milan Store”, the official shop of the team and “Cucina Milanello” restaurant that offers complete food services, from breakfast to lunch to happy hours. - Welcome and assistance at Milan Visitor Center. You can change your Voucher directly on the open bus City Sightseeing® or at Milan Visitor Center - Largo Cairoli / Via Cusani open every day from 09:00 a.m. up to 07:00 p.m.